Opinion: Is the case for Apple ending its patent battles with Samsung stronger than ever? Steve Jobs famously declared back in 2010 that Android was a stolen product, and he was willing to “go thermonuclear war” in order to “destroy” it. Simply put, the court battles are no longer particularly relevant: Samsung is losing in the marketplace. Samsung recently reported a 31 percent drop in profits for its mobile division, a hit sufficiently embarrassing to the company that its senior managers handed back part of their bonuses and agreed to fly economy as a way of expressing their regret. Nor is this decline a recent phenomenon. While the company as a whole has been doing well, that has mostly been due to the strong performance of its consumer electronics (televisions in particular), display and semiconductor divisions. The smartphone business has struggling for some time. Samsung has always tried to be all things to all people in the smartphone market, from its flagship Galaxy S series to cheap-and-cheerful models sold mostly in developing markets like China and India. 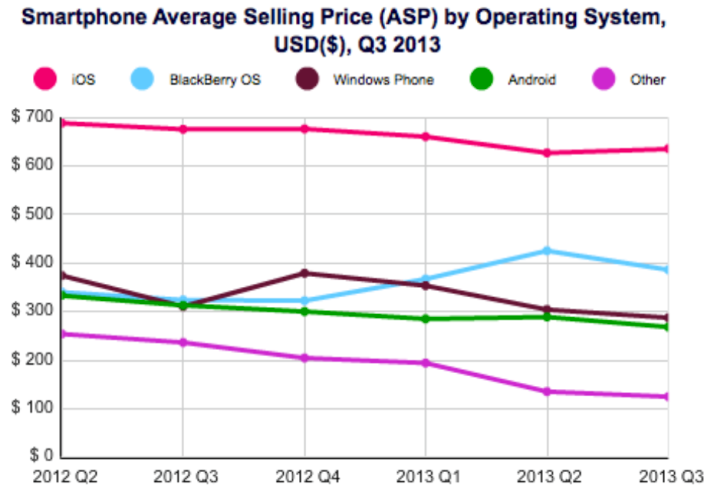 Its high-end handset sales – the only area where it competes with Apple – have been declining. To address this, the company’s co-CEO told Reuters back in April that the company would be focusing more on cheaper models. JK Shin, co-chief executive and head of Samsung’s mobile business, has called it a “back-to-basics” strategy that will help the world’s biggest technology company by revenue rein in component costs and make products of wider appeal. Not that it can expect an easier ride at the low-end. Competition from Chinese brands has been aggressive. Xiaomi, Huawei and ZTE have all seen their share of the smartphone market increase over the past year. It’s not that I think Apple was wrong to pursue its court battles to date. While the financial impact on Samsung may have been limited, it did achieve a valuable PR objective: it helped establish Apple’s image as the market leader while successfully depicting Samsung as a copycat. Apple may never have lowered itself to using terms like Samesung, but the court battles helped establish that perception out there in the marketplace – and generated graphics like the one above. Samsung, by the way, used to make no secret of its copycat approach, with marketing strategy documents acknowledging its ‘fast follower’ heritage: a company that watches what the market leader does and then aims to be next to market with something similar. But that’s an image it’s been fighting hard to leave behind, and it’s the patent trials that have made that so difficult. The question now is whether further court battles will achieve anything more. If the most recent award has established a precedent for the value of individual patents, further cases make no financial sense for Apple. And I’d argue that the PR battle has already been won. Will it remain won forever? Maybe not. Memories may be short. But if that proves to be the case, there’s nothing to stop Apple heading back to the courts again as & when it needs to send a reminder to the market. But for the foreseeable future, I think the job has been done. But what of the rest of the Android market? Ok, you might say, but what about those up-and-coming Android brands? Companies like Xiaomi, Huawei, ZTE? Don’t they also represent a threat? Maybe they will one day, and perhaps when that day comes it will make sense to take them on. But right now? Nope: they are not competition for Apple, they are competition for the established Android brands: Samsung, HTC, Motorola. Sure, Apple’s market share has been falling now for some time, but that’s not because iPhone sales are falling – they’re not, they’re growing – but because market share is being diluted by low-end smartphones. Smartphones bought by people who would never be in the market for an iPhone. Apple isn’t interested in the low-end of the smartphone market. Despite some initial rumors about the iPhone 5c before it appeared, Apple isn’t interested in the mid-market either. It’s interested only in the premium slice at the top of the market, and the new players aren’t yet having any impact there. There’s nothing to be gained by Apple taking any of those players to court because, to a premium brand, they’re irrelevant. Apple has very slowly been softening its stance on its battles with Android. It agreed back in May to settle all patent litigation with Motorola. In July, it decided to drop a motion for injunctions against older Samsung models, despite them being still sold in some markets. And just a few days ago, Apple and Samsung agreed to end all patent disputes outside the USA. We’re going to continue to see further court action in follow-up to the second Apple v Samsung patent trial, but I do wonder whether we might now manage to avoid a third.